What's a better way to end a Sunday than with a delicious sundae? 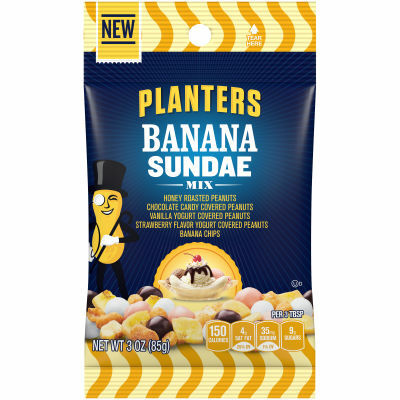 Planters Banana Sundae Mix brings together the delicious flavors and textures of honey roasted peanuts, chocolate candy covered peanuts, vanilla yogurt covered peanuts, strawberry flavor yogurt covered peanuts and banana chips to deliver the premium taste of a banana sundae. Greet your sweet-loving guests with this decadent sundae mix in a convenient 3 oz. bag.